R48 #1 two-time defending USHA Four Wall National champion Killian Carroll and three-time R48 champion and Irish cross over sensation Robbie McCarthy kicked off a blockbuster All-Irish singles semifinals at the World Championship/USHA Four Wall Nationals Singles. Carroll and McCarthy have traded wins throughout the years, with McCarthy edging Carroll 21-19 in the third game of the 2015 All Ireland final and Carroll overcoming McCarthy in their last two encounters in Salt Lake City and Tucson in 2017. McCarthy tackled Carroll to start the match, playing flawlessly en route to an 8-0 lead. Carroll earned his first side out after eight rallies, but was unable to derail the Buzzsaw. “I’ve never seen Robbie play so aggressively,” barked R48 #4 Danos Cordova. Carroll found his groove midway through the first game, cutting the McCarthy deficit to one at 8-9, but McCarthy took off again, taking a 17-9 lead. “McCarthy is just so precise and making unbelievable shots,” barked R48 #3 Mando Ortiz. McCarthy would ultimately take game one, 21-13. Carroll and McCarthy traded haymakers throughout the first half of game two, with both playing at the top of their game. At 12-8, Carroll found another gear, taking over rallies with power passes and kills to take control of the game. Carroll would lead 20-10, closing the game out on his fourth attempt, 21-13. Carroll continued to play outstanding ball in the tiebreaker, racing to a 3-0 and 8-1 lead. “It just looked like McCarthy started playing more passively and not going for his shots,” stated R48 qualifier hopeful Pete Papathemetrios. Carroll never allowed McCarthy into the tiebreaker, constantly applying pressure with a two-handed attack and advancing to his second consecutive World Championship final. “The Gunner” was unable to take the court against the “Man of Steel” due to the ankle injury he suffered in the first game of his quarterfinal match on Thursday, meaning Mulkerrins advanced to the final via forfeit. Catriona Casey was in search of her first World Championship to add to her four USHA Four Wall National titles and 15 WR48 titles, while Aisling Reilly was looking to retain the world title she’s held since 2012. 2018 All Ireland champion Martina McMahon and former WR48 finalist Ciana Ni Churraoin were both aiming to build their legacies as the women’s quarterfinals kicked off on Friday. Catriona Casey was in standard form against food friend Aoife McCarthy, allowing just three points in two games. “Catriona was playing one of her best friends and still trying to put a zero on her,” stated Dave Vincent. Ciana Ni Churraoin was competing in her first event in more than a year following knee surgery and did not look like she missed a beat, dominating fourth-seeded Pauline Gallagher by overpowering her Irish counterpart and executing crisp kills. Martina McMahon was in control throughout her two-game sweep of WPH cross over star Tracy Davis, never allowing Davis to gain any traction during the 21-minute match. 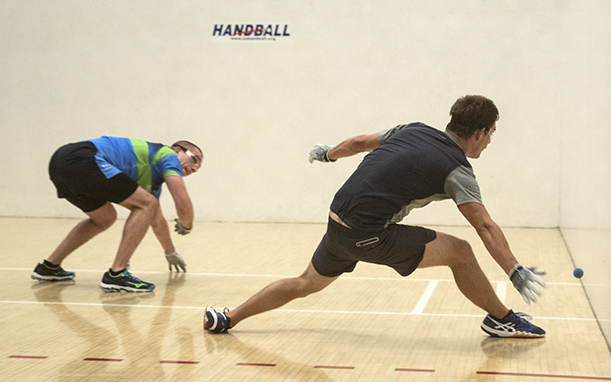 Robbie McCarthy & Diarmaid Nash advance to the semifinals with a 21-15, 21-4 win over Michael Hedigan / Daniel Relihan; meanwhile, the #2 seeded team of Marcos Chavez/Sean Lenning got past Tadgh Carroll / Ryan Harkin in two close games (21-12, 21-16). Armando Ortiz and Vic Perez defeated Darragh Daly and Michael Gregan, 21-16, 21-12. The match of the doubles bracket, thus far, comes as sell-out crowds packed the U of M rec center bleachers. Daniel Cordova and brother Luis Cordova served to take game one only once but came up short, as this year’s singles finalists, Martin Mulkerrins and Killian Carroll fight to get the side out and eventual point to win 21-20. In game two, Team Cordova (aka ‘The Flying Cordovas’) had the lead throughout the match to include a 20-16 advantage, but Mulkerrins and Carroll kept edging closer until the score was tied at 20. Remarkable diving gets and back wall kills were on display before a Carroll flat mouse roll out; followed by a screaming pass shot gave Team Ireland the final point; 21-20, 21-20.